the sparkly life: How to Throw A (Faux) Sleepover Party! 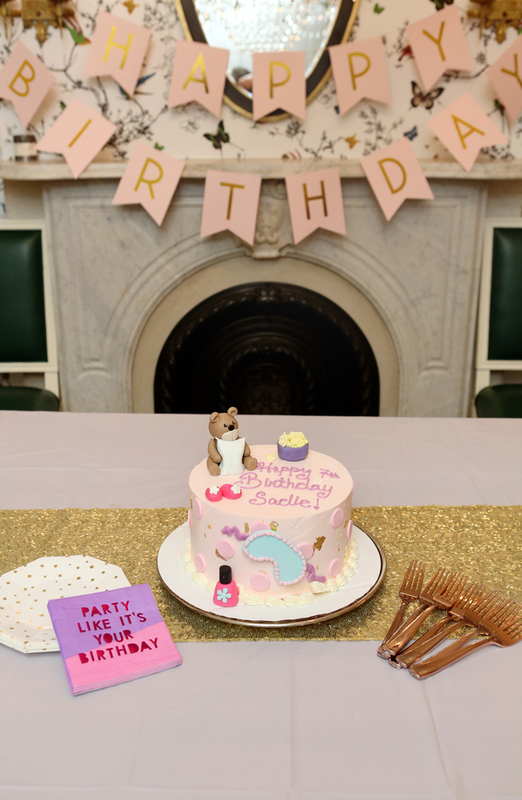 How to Throw A (Faux) Sleepover Party! 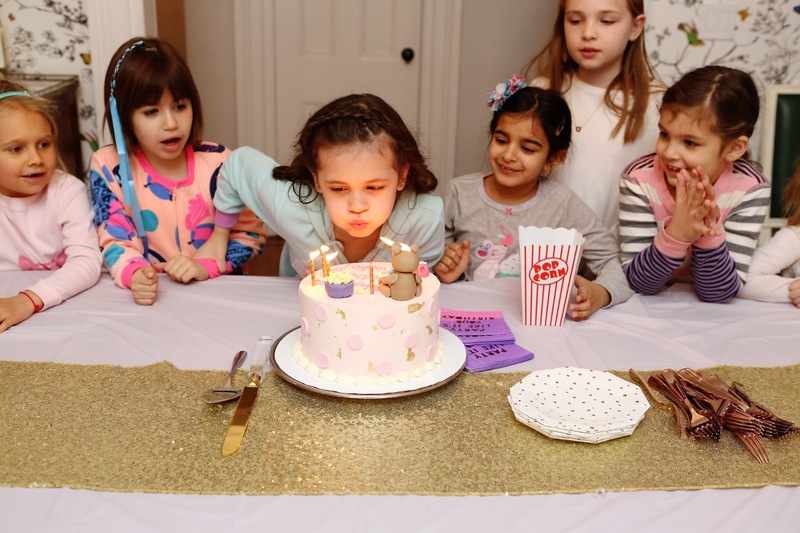 My daughter wanted a sleepover party for her 7th birthday, but I wasn't into the idea. Seven seems too young, right? Sure, I had had my own sleepover birthday parties for years when I was growing up, but 1) I think I was slightly older when I had my first one, and 2) I remember every single one devolving into an us versus them scenario with half of my friends mad at the other half--and one of those halves stamping off in the middle of the night to go sleep in another room. By breakfast time, all was usually forgiven, but did my kid really need all that drama so soon? Nope. Around that time, my cousin happened to mention that "faux sleepovers" were really popular in her area, and it sounded like just the thing. For anyone who doesn't know what that is (I didn't), it's all of the fun of a sleepover--the pjs, the movie, the popcorn, the bonding--but none of the sleeping! Everyone leaves to go to bed at their own home. Genius! My daughter was into it; I was in love with it. Faux sleepover party, it would be. And it ended up being the easiest party I've ever thrown! 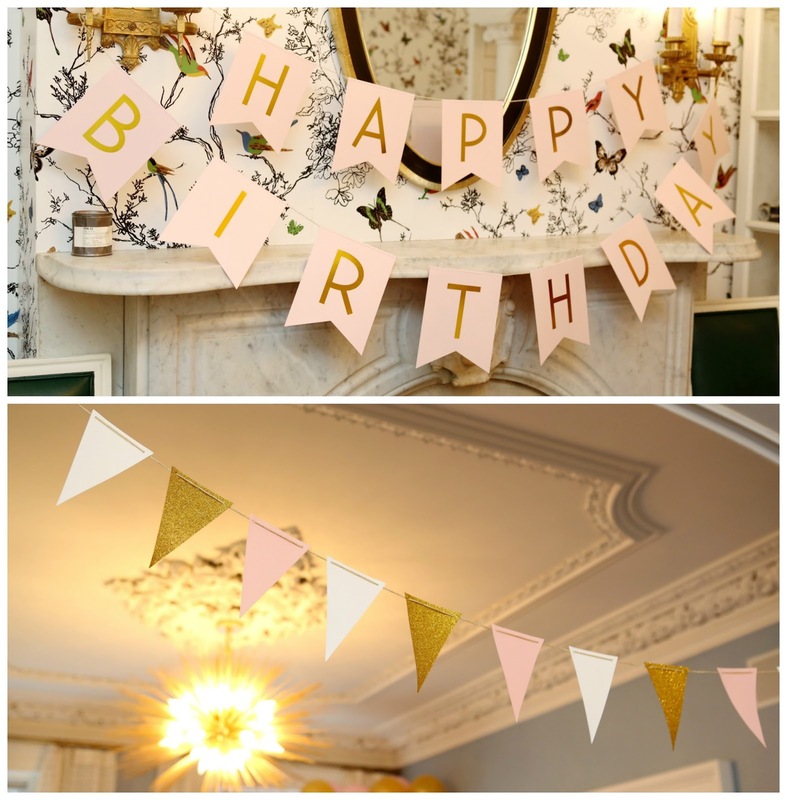 Decorations were simple. I went with a pink-and-gold color scheme and just hung a few balloons and banners. 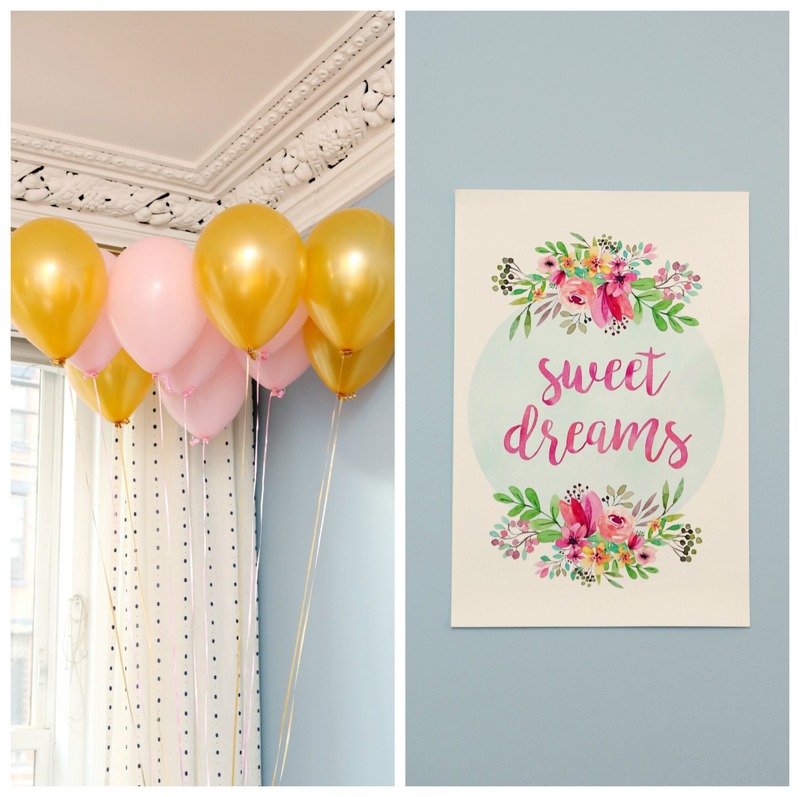 I also hung up a piece of printable art from Etsy that said "Sweet Dreams." Etsy printable wall art is one of my favorite ways to decorate for a party, because 1) It's cheap. (This one cost just a few dollars.) 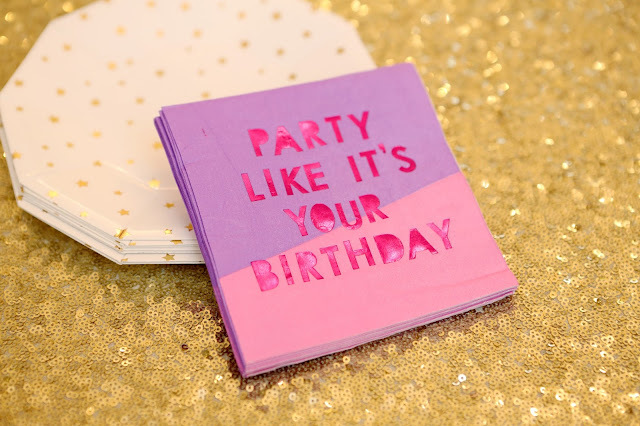 and 2) It can be repurposed as wall art for her room after the party. As a bonus, this Etsy artist also shrunk the art down for me, so that I could also use it as favor tags! 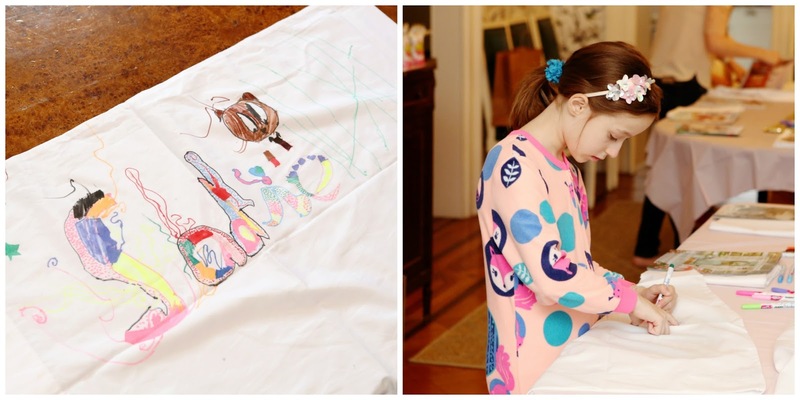 When it was party time, the girls arrived in their pajamas and got to work on an art project: decorating pillowcases. I bought fabric pens and cheap white pillow cases from Amazon, and the girls really loved making them. And can I just stop and sing the praises of movie-watching at a party? WHY DID I NEVER THINK OF THIS BEFORE? The kids sat there quietly for 2-plus hours, while my parents and a few friends and I sat upstairs drinking wine. 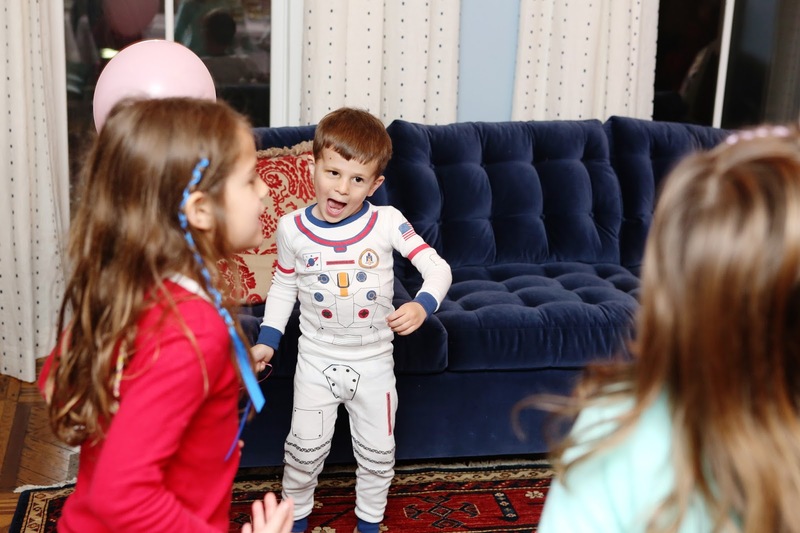 I'm usually running around crazy-stressed at my kids' parties, but this time I was practically bored! During the movie, the girls munched on popcorn topped with candy from a candy bar I had set up. (I had worried that I had bought too much candy, but the girls ate ALL of it. Many of them had more candy than popcorn. Sorry, parents.) Halfway through, we brought out pizza and they ate that while watching, too. I also had a hairstylist from The Glam App come to braid their hair during the movie. 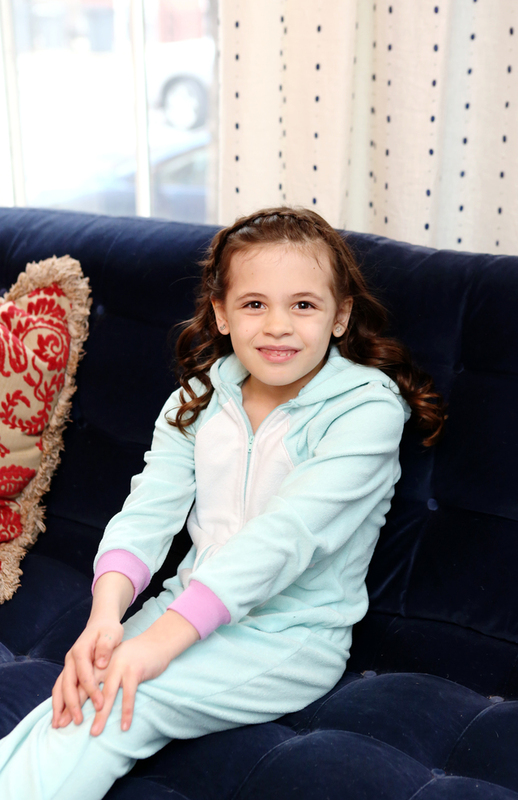 (She set up a chair in the room, and one by one, the girls would come up to get their braids.) This was a big hit, and I'm so glad I did it! The hairstylist even brought ribbons to weave through their braids, which was really cute. 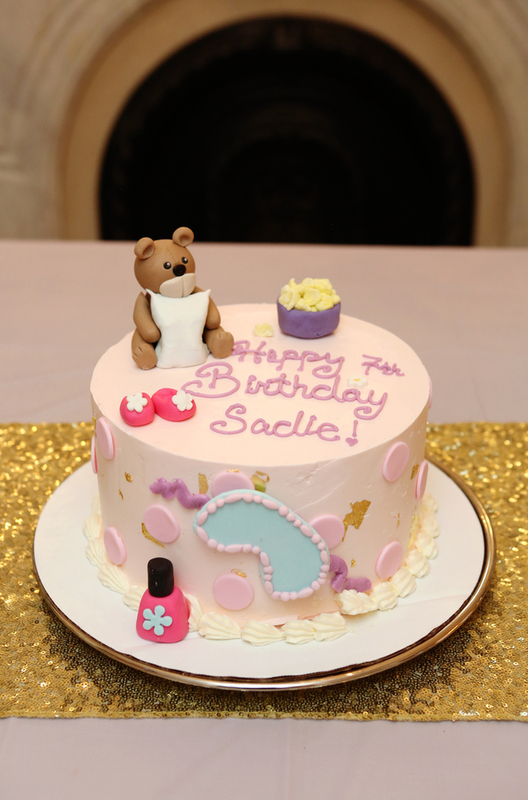 After the movie, we had a gorgeous, sleepover-themed cake created by GoodieBox Bake Shop, and then finished up with a dance party. 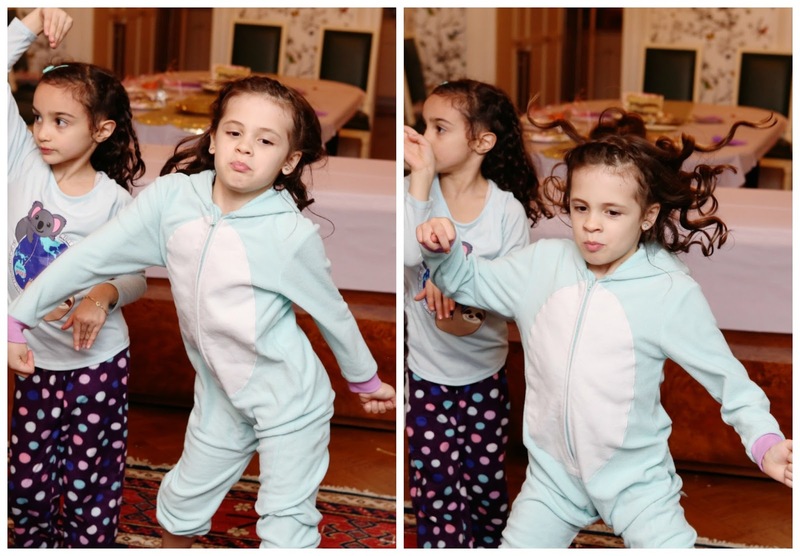 The girls went nuts dancing and singing. It was so cute! 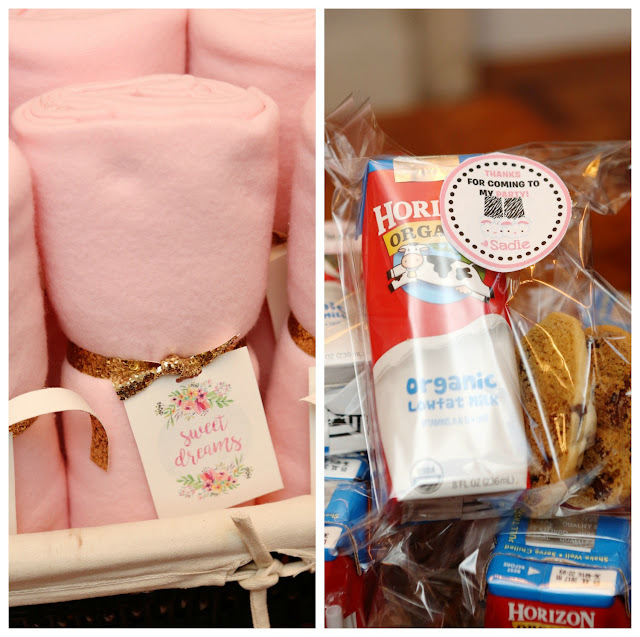 Favors were pink fleece blankets tied with gold ribbon and a cute "Sweet Dreams" favor tag, along with a bag of milk and chocolate chip cookies. (My mom made the cookies!) Then, everyone left to sleep...somewhere else. 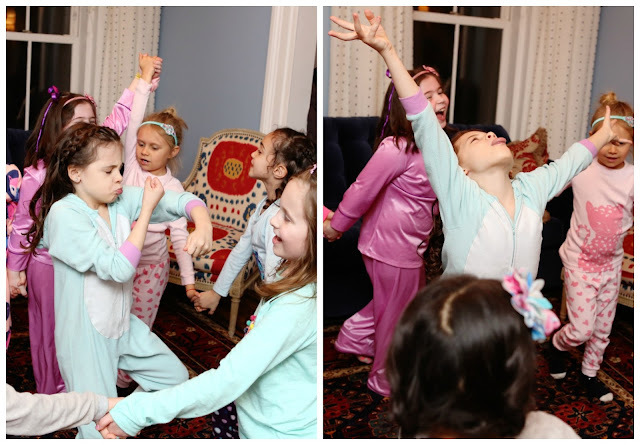 So, tell me: Are these faux-sleepover parties popular where you guys live? (I've heard they're also called "Sleepunders.") I hadn't ever heard of them before, but I love them now! 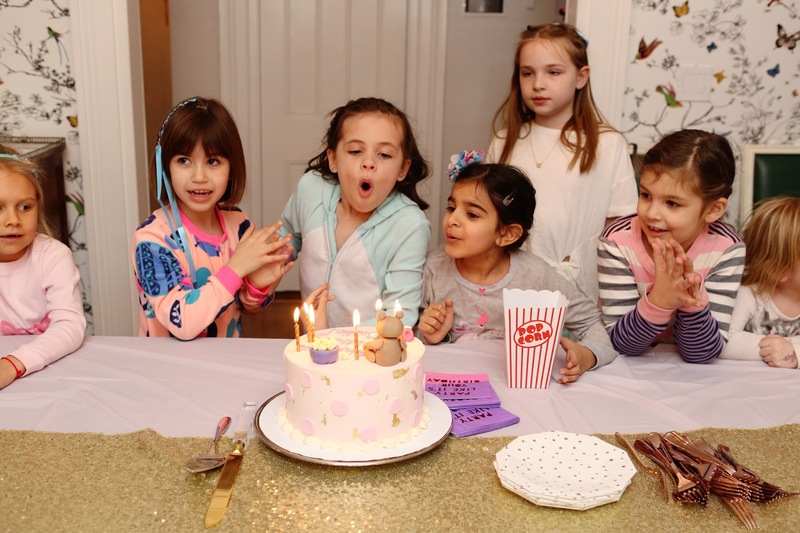 So smart for girls who are fascinated by sleepovers, but really too young to go to them. 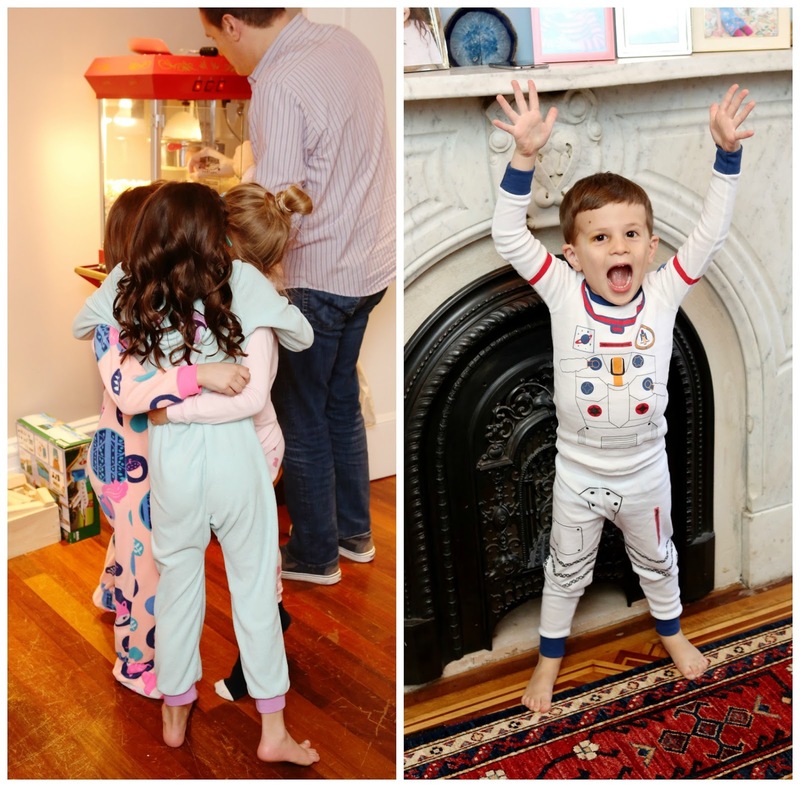 This is SUCH a great idea, not just for kids who aren't old enough, but for those families who might not feel comfortable with the idea of 'real' sleepovers. I love it!! Great pics!! Oh my gosh...I LOVE this!!!! Genius! My son has been wanting a sleepover too, but he's also 7, and I think too young. This would be perfect, minus the hair braiding ;) (Although, I would love that!) 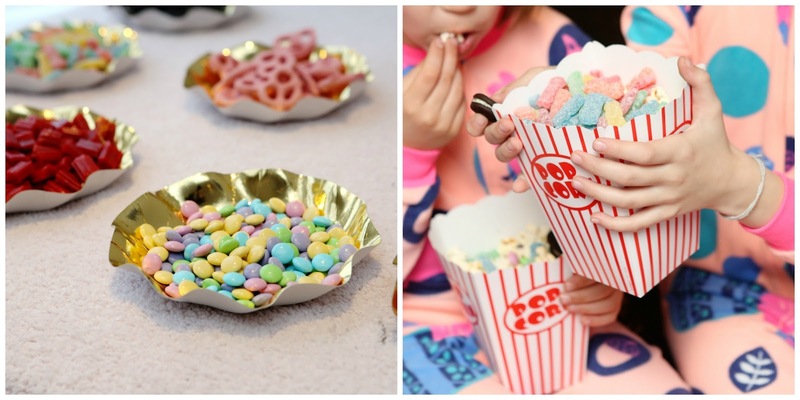 The candy bar is such a great idea too. And I love that you have the popcorn popper all the time now. Great party! You are such a fun mommy! Getting to much on popcorn, while getting hair done, while watching a fun movie - sounds like a fun party for moms too!